The regulation of a gene depends on the binding of transcription factors to specific sites located in the regulatory region of the gene. The generation of these binding sites and of cooperativity between them are essential building blocks in the evolution of complex regulatory networks. We study a theoretical model for the sequence evolution of binding sites by point mutations. The approach is based on biophysical models for the binding of transcription factors to DNA. Hence we derive empirically grounded fitness landscapes, which enter a population genetics model including mutations, genetic drift, and selection. We show that the selection for factor binding generically leads to specific correlations between nucleotide frequencies at different positions of a binding site. We demonstrate the possibility of rapid adaptive evolution generating a new binding site for a given transcription factor by point mutations. The evolutionary time required is estimated in terms of the neutral (background) mutation rate, the selection coefficient, and the effective population size. The efficiency of binding site formation is seen to depend on two joint conditions: the binding site motif must be short enough and the promoter region must be long enough. These constraints on promoter architecture are indeed seen in eukaryotic systems. Furthermore, we analyse the adaptive evolution of genetic switches and of signal integration through binding cooperativity between different sites. Experimental tests of this picture involving the statistics of polymorphisms and phylogenies of sites are discussed. The expression of a gene is controlled by other genes expressed at the same time and by external signals, a process called gene regulation . Due to the combinatorial complexity of regulation, a large number of functional tasks can be performed by a limited number of genes. Differences in gene regulation are believed to be a major source of diversity in higher eukaryotes. To a large extent, gene regulation is the control of transcription. It is accomplished by a number of regulatory proteins called transcription factors that bind to specific sites on DNA. These binding sites contain about 10 – 15 base pairs relevant for binding and are mostly located in the cis-regulatory promoter region of a gene. A cis-regulatory region in E. coli is about 300 base pairs long and contains a few transcription factor binding sites . There may be two or more sites for the same factor in one promoter region. At the same time, the sequences of binding sites are fuzzy, that is, different sites for the same factor differ by about 20 – 30 percent of the bases relevant for binding . This makes the identification of sites a difficult bioinformatics problem [3–5]. Frequently, the simultaneous binding at two nearby sites is energetically favoured. This so-called binding cooperativity can be related to various functions. In a genetic switch such as the famous phage lambda switch in Escherichia coli , it produces a sharp increase of the expression level at a certain threshold concentration of a transcription factor. A pair of sites for two different kinds of factors with cooperative binding can be a simple module for signal integration, leading to the expression of the downstream gene only when both kinds of factors are present simultaneously . These examples are discussed in more detail below. Regulation in higher eukaryotes shares these features but is vastly more complicated . A promoter region is typically a few thousand base pairs long and contains many different binding sites with often complex interactions. At the same time, individual sites are shorter, with about 5–8 relevant base pairs. The sites are sometimes organized in modules interspersed between regions containing no sites. In many known cases, the expression of a gene depends on the simultaneous presence of several factors. Well-studied examples of regulatory networks in eukaryotes include the sea urchin Strongylocentrotus purpuratussea  and the early developmental genes in Drosophila . The sequence statistics of binding sites has been addressed in two recent theoretical studies [10, 11]. Based on a model incorporating the biophysics of sequence-factor interaction [12, 13], a fitness landscape for binding site sequences is constructed (see the discussion in the next section). The resulting mutation-selection equilibrium is analysed using a mean-field quasispecies approach . This approach, which neglects the effects of genetic drift, is applicable in very large populations. In both studies [10, 11], fuzziness is attributed to mutational entropy as a possible reason: the single or few sequence states with optimal binding of the transcription factor can be outweighed by the vastly higher number of sub-optimal states at some mutational distance from the optimal binding sequence. This effect is similar to the fuzziness of amino acid sequences in proteins discussed in . From an evolutionary perspective, explaining the molecular programming of regulatory networks presents a striking problem. The diversification of higher eukaryotes, in particular, requires the efficient generation and alteration of regulatory binding interactions. One likely mode of evolution is gene duplications with subsequent complementary losses of function in both copies [16, 17]. However, the differentiation of regulation should also require complementary processes that generate new functions of genes as a response to specific demands. This task must be accomplished mainly by sequence evolution of regulatory DNA. There are examples of highly conserved regulatory sequences with a conserved function but binding sites can also appear, disappear, or alter their sequence even between relatively closely related species; see, e.g., refs. [18–22]. This turnover of binding sites has been argued to follow an approximate molecular clock in Drosophila . The transcription factors themselves are known to remain more conserved, especially if they are involved in the regulation of more than one gene. The modes of regulatory sequence evolution and their relative importance remain largely to be explored. Contributions may arise from point mutations, slippage processes , and larger rearrangements of promoter regions . The latter processes may lead to the shuffling of entire modules of binding sites between different genes. In this paper, we are more interested in the local sequence evolution within a module, which has been argued to contribute most of the promoter sequence difference between species . It is also the most promising starting point for a quantitative analysis of binding site evolution. We study a theoretical model that takes into account point mutations, selection, and genetic drift. The form of selection is inferred from the biophysics of the binding interactions between transcription factors and DNA. We derive the stationary distribution of binding sites under selection, which shows specific correlations between nucleotide frequencies at different positions in a binding site. The non-stationary solutions of the model describe efficient adaptive pathways for the molecular evolution of regulatory networks by point mutations. This efficiency can be quantified in terms of the length of the binding motif, and the length of the promoter region, and the fitness landscape for factor binding, which is amenable to quite explicit modeling. With the parameters found in natural systems, our model predicts that a new binding site for a given transcription factor can be generated by a fast series of adaptive substitutions, even if the expression of the corresponding gene bears even a modest fitness advantage. The evolutionary time required for site formation in response to a newly arising selection pressure is estimated in terms of the characteristic time scales of mutation, selection, and drift. For Drosophila, it may be as short as 105 years even for moderate selection pressures. However, this pathway is found to depend crucially on the presence of selection. It would be too slow under neutral evolution, in contrast to the results of , see also the recent discussion in . Cooperative interactions between binding sites can evolve adaptively on similar time scales, as we show for the two simple examples alluded to above, the genetic switch and the signal integration module. These results are discussed at the end of the paper with particular emphasis on possible experimental tests. It is important to note the status of this "minimal model" of binding energies for the discussion in this paper. Both approximations underlying the model can be violated. Even though typical mismatch energies are of the same order of magnitude, there can be considerable differences between different substitutions at one position and between different nucleotide positions. Moreover, deviations from the approximate additivity of binding energies for the single nucleotide positions have also been observed. However, these complications do not affect the order-of-magnitude estimates for adaptive sequence evolution. As it will become clear, the efficiency of binding site formation depends only on the qualitative shape of the fitness landscapes derived below. In these landscapes, the regime of weakly-binding sequences and of strongly-binding sequences are separated by only a few single nucleotide substitutions. The relative magnitude of the fitness increase of these substitutions does not matter in first approximation. Indeed, inhomogeneities in the values of the ε i (a) tend to reduce the number of crucial steps in the adaptive process and thereby to further increase its speed. Here ε is the binding energy per nucleotide mismatch and ε ρ is the chemical potential measuring the factor concentration. Both parameters are expressed in units of k B T and hence dimensionless. Appropriate values for typical binding sites have been discussed extensively in refs. [10, 13]. It is found that ε should take values around 2, which is consistent with the measurements for known transcription factors mentioned above [28–30]. The chemical potential depends on the number of transcription factors present in the cell, on the binding probability to background sites elsewhere in the genome (which have a sequence similar to the target sequence by chance), and on the functional sites in the in the genome other than the binding site in question that may compete for the same protein. Binding to background sites does not significantly reduce the binding to a specific functional site . This leads to values ρ ≈ (log n f )/ε ≈ 2 - 4, given observed factor numbers n f of about 50 – 5000 . Binding to other copies of the same functional sequence becomes only relevant at low factor concentrations and high number of copies, when sites compete for factors. Here the selection coefficient s α is defined as the fitness difference (due to different expression of the downstream gene) between the cases of complete factor binding and no binding in the state α. Such fitness differences can now be measured directly in viral systems . Inserting (1), the fitness becomes a function of the Hamming distance r only. We note that the fitness F is measured relative to that of a phenotype with zero binding probability in any state α.
with a high-fitness rim between ρoff and ρon flanked by two sigmoid thresholds; see fig. 1(a). The generic features of this fitness landscape are easy to interpret: the two-state selection assumed here favors intermediate binding strength (i.e., intermediate Hamming distances r) where binding occurs and the gene is expressed in the on state but not in the off state. Sequences with large Hamming distance r >ρon can bind the factor neither in the on nor in the off state, while sequences with r <ρoff lead to binding in the on and the off state. Both cases lead to misregulation of the downstream gene, and hence to a lower fitness. We note that the key feature of these fitness landscapes, the sigmoid thresholds, is independent of the particular choices of son and soff. 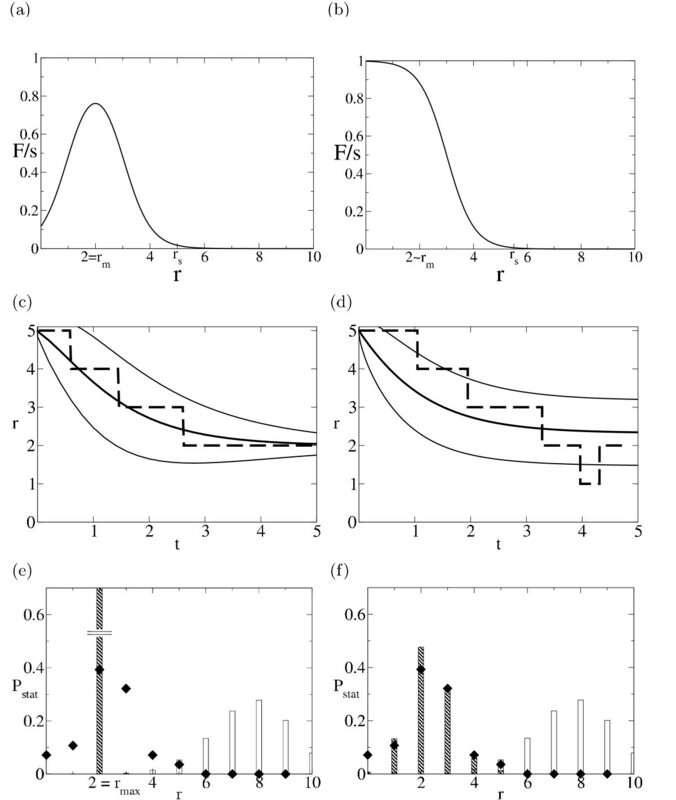 Fitness landscapes and adaptive evolution for a single binding site (a) Crater landscape (3) and (b) Mesa landscape (4), as a function of the Hamming distance r from the target sequence (within the approximation of the two-state model). rm gives the point where the binding probability reaches a maximum (crater landscape), or else values close to 1 (mesa landscape). r s approximately indicates the onset of selection, i.e. a binding probability appreciably different from zero. (c) Adaptive dynamics as a function of time t measured in units of 1/(2s μ N) in the crater landscape at strong selection (sN = 100). Single history r(t) (dashed lines), ensemble average (thick solid lines) and width given by the standard deviation curves ± δ r(t) (thin solid lines), (d) Same as (c) in the mesa landscape at moderate (sN = 6.8) selection, (e) Stationary ensembles Pstat(r) of binding site sequences with in the crater landscape at strong selection (filled bars) and for neutral evolution (empty bars). (f) Same as (e) in the mesa landscape at moderate selection, together with the histogram of Hamming distances of CRP site sequences in E. coli from their consensus sequence (diamonds, from ). which has a high-fitness plateau of radius ρ and one sigmoid threshold; see fig. 1(b). In this case, all sequences with sufficiently small Hamming distance to the target sequence (r <ρon) have a high fitness. In both cases, the parameters of the binding model have a simple geometric interpretation: ε gives the slope and the ρ α give the positions of the sigmoid thresholds in the fitness landscape. Eqs. (3) and (4) are again to be understood as minimal models of fitness landscapes for binding sites, representing target sequence selection for a given level of binding (ρoff <r <ρon) and for sufficiently strong binding (r <ρon), respectively. Despite its simplicity, this type of selection model based on biophysical binding affinities is nontrivial from a population-genetic viewpoint since it leads to generic correlations between frequencies of nucleotides a i and a j within a site, see the Results section below. We will also study generalized models with correlations between two sites generated by cooperative binding. On the other hand, these models neglect the context dependence of the binding process through cofactors and chromatin structure. However, they are a good starting point for order-of magnitude estimates of the adaptive evolution of binding sites. The rates of nucleotide point mutation show a great variation, ranging from μ ~ 10-4 per site and generation for RNA viruses to values several orders of magnitude lower in eukaryotes, e.g. μ ≈ 2 × 10-9 in Drosophila . (Here we model mutation as a single-parameter Markov process; we do not distinguish between transitions and transversions.) The evolution of a sufficiently large population under mutation and selection can be described in terms of the average fraction of the population with a given binding sequence. This so-called mean-field approach neglects the fluctuations due to finite population size (genetic drift). It leads to the so-called quasispecies theory . For a population of sequences at a single binding site, the quasispecies population equation can be written for the fraction n(r,t) of individuals at Hamming distance r from the target sequence at time t. Along with a generalisation for two binding sites, it has been analysed in detail in ref. . For the mesa landscape, the stationary solution nstat(r) has been found exactly . It depends only on the ratio s/μ and describes a stable polymorphic population, i.e., several sequence states coexist. The mean-field approach is valid as long as the stochastic reproductive fluctuations are leveled out by mutations. This requires absolute population numbers Nnstat(r) ≫ 1/μ for all relevant r, a stringent condition on the total population size N.
in a diffusion approximation valid for ΔF ≪ 1 . Here N is the effective population size (with an additional factor 2 for diploid populations). Eq. (5) has three well-known regimes. For substantially deleterious mutations (N ΔF ≲ - 1), substitutions are exponentially suppressed. Nearly neutral substitutions (N|ΔF| ≪ 1) occur at a rate u ≈ μ approximately equal to the rate of mutations in an individual. For substantially beneficial mutations (N ΔF ≳ 1), the substitution rate is enhanced, with u ≃ 2μ N ΔF for N ΔF ≫ 1. In this picture, a population has a monomorphic majority for most of the time and occasional coexistence of two sequence states while a substitution is going on. The time of coexistence is T ~ N for nearly neutral and T ~ 1/ΔF for strongly beneficial substitutions. The picture is thus self-consistent for Tu ≪ 1, i.e., for μ N ≪ 1. Asymptotically, it describes monomorphic populations moving through sequence space with hopping rates u.
is obtained from a flat distribution over all sequence states. For moderate selection (2sN ~ 1), Pstat(r) results from a nontrivial balance of stochasticity and selection. For strong selection (2sN ≫ 1), Pstat(r) takes appreciable values only at points of near-maximal fitness, where F(r) ≳ Fm - 1/2sN. In this regime, the dynamics of a population consists of beneficial mutations only, i.e., the system moves uphill on its fitness landscape. The Master equation (6) and the mean-field quasispecies equation thus describe opposite asymptotic regimes, μ N ≪ 1 and μ N ≫ 1, of the evolutionary dynamics. Effective population sizes show a large variation, from values of order 109 in viral systems to N ~ 106 in Drosophila and N ~ 104 - 105 in vertebrates. (These numbers bear some uncertainty; one reason is that TV varies across the genome .) We conclude that the mean-field quasispecies is well suited for viral systems, while eukaryotes clearly show a stochastic dynamics of substitutions. In the specific case of the two-state model, ν0(a i ) is simply a flat distribution over nucleotides but it is obvious how this form can be generalized to arbitrary nucleotide frequencies. The salient point is that F(r) is generically a strongly nonlinear function of r due to the sigmoid dependence of the binding probability on r. An analogous statement holds beyond the two-state approximation for the dependence of F on the binding energy E. Hence, even if (a1,...,a l ) factorizes in the single nucleotide positions, (a1,...,a l ) does not. The selection introduces specific correlations between the nucleotides: the fitness differences and, hence, the nucleotide frequencies at one position i depend on all other it l - 1 positions in the motif. and takes values of a few times 1/s μ N. We emphasize again that this simple form depends only on the qualitative form of the fitness landscape, namely, that weakly and strongly binding sequence states are separated only by few point mutations. The conclusions are thus largely independent of the details of the fitness landscape, which justifies using the two-state approximation. is calculated in the appendix. It is generically much larger than the adaptation time T s , rendering the effective generation of a new site less feasible. The stationary distribution Pstat(r) under selection is given by (7) and shown as filled bars in fig. 1(e),1(f). For strong selection, it is peaked at the point rm of maximal fitness. For moderate selection, it takes appreciable values for r = 0 - 4: the binding site sequences are fuzzy. Assuming that the CRP sites at different positions in the genome of E. coli have to a certain extent evolved independently, we can fit Pstat(r) with their distance distribution (data taken from ). At the values of ε and ρon chosen, the two distributions fit well, see fig. 1(f). This finding is discussed in more detail below. The cooperative binding of transcription factors involves protein-protein interactions which may be specific to the DNA substrate. These interactions often do not require conformational changes of either protein involved and depend only on few specific contact points. They result in a modest energy gain of order 3 – 4k B T . Hence, it is a reasonable simplification to study the adaptive adjustment of binding affinities using a simple generalisation of the two-state binding model. We define the energies E1/k B T = ε r1 and E2/k B T = ε r2 for the binding of a single factor and for the simultaneous binding of both factors. The cooperativity gain is assumed to result from mutations at positions in the DNA sequences of the factors, which encode the amino acids at the protein-protein contact points. These mutations define a Hamming distance from the target sequence for optimal protein-protein binding, and 2γε/ is the binding energy per nucleotide. Here we use the values ε = 2, = 6 and γ = 1 but the qualitative patterns shown below are rather robust. Here we discuss two simple examples of fitness landscapes where binding cooperativity evolves by adaptation to specific functional demands. A genetic switch with a sharp expression threshold is favoured in a system with a single transcription factor having similar concentrations in its on and off cellular state. As can be seen from eq. (14), cooperative binding can sharpen the response of the binding probability to variations in factor concentration, q++ ~ 1/[1 + exp(-2ε ρ + ...)] versus p ~ 1/[1 + exp(-ε ρ + ...)] as given by (1) for individual binding. Figs. 2(a),2(c) show the fitness landscape F(r1, r2, γ) obtained from (14) and (15) for ρon = 2.5, ρoff = 1.5, and s = son = -soff. A simple signal integration module responds to two different factors in four different cellular states, (on, on), (on, off), (off, on), (off, off). Individually weak but cooperative binding leads to expression of the gene only if both factors are present simultaneously. This case is favoured by a fitness function of the form (15) with selection coefficients s = -soff,off = -son,off = -soff,on = son,on/2. The resulting fitness landscape F(r1, r2, γ) is shown in figs. 2(b),2(d) for chemical potentials ρon = 3, ρoff = 1 (for each factor). Fitness landscapes and adaptive evolution for a pair of sites with cooperative binding. Genetic switch (left column), signal integration module (right column). (a,b) Fitness landscape F(r1, r2) without cooperativity (γ = 0). (c,d) Fitness landscape. F(r1, r2) with cooperativity (γ = 1). Next-nearest neighbour states (r1, r2) and of similar fitness are linked by compensatory mutations if the intermediate states (r1, ) and ( , r2) have lower fitness. (e,f) Adaptive dynamics: ensemble averages and (thick lines), ensemble width given by (same for r2 and (thin lines); cf. fig. 1(e,f). In both cases, a pair of sites with weaker individual binding (r1, r2 = 3 - 4) and cooperativity (γ = 1) is seen to have a higher fitness than an optimal pair (r1 = r2 = 2) without cooperativity, as expected. Adaptive pathways and for strong selection (sN = 100) are shown in fig. 2(e),2(f). Typical adaptation times T s are again a few times 1/(s μ N). A closer look reveals that this fast adaptation sometimes leads to a metastable local fitness maximum with some degree of cooperativity. Compensatory mutations (see below) are then required to reach the global maximum, a process that may be considerably slower. The fuzziness δ r1,2(t) and δγ(t) observed in fig. 2(e),2(f) decays on the larger time scale of compensatory mutations, reflecting the presence of such metastable states. Transcription factors and their binding sites emerge as a suitable starting point for quantitative studies of gene regulation. Binding site sequences are short and their sequence space is simple. Moreover, the link between sequence, binding affinity, and fitness is experimentally accessible. For a single site, the simplest examples are of the mesa  or of the crater type, see fig. 1(a),1(b). Landscapes for a pair of sites with cooperative binding interactions are of a similar kind as shown in fig. 2(a),2(b),2(c),2(d). They can be used to predict the outcome of specific single-site mutation experiments to a certain extent. Despite this simplicity, the evolutionary dynamics of binding sites is far from trivial, since it is governed, in the generic case, by the interplay of three evolutionary forces: selection, mutation, and genetic drift. Here we have focused on the dynamical regime appropriate for eukaryotes, where the evolution can be approximated as a stochastic process of substitutions. We find the possibility of selective pathways generating a new site in response to a newly arising selection pressure, starting from a neutrally evolved initial state and progressing by point substitutions. Such a selective formation takes roughly T s ≈ Δr/(2s μ N) generations, where Δr is the number of adaptive substitutions required. This number is given by the Hamming distance between the onset of selection and the point of optimal fitness, Δr = r s - r m , and takes values 2 – 3 for typical fitness landscapes; see fig. 1(a),1(b). For Drosophila melanogaster, with μ ≈ 2 × 10-9  and N ≈ 106, the resulting T s is of the order of 106 generations or 105 years even for sites with a relatively small selection coefficient s = 10-3. Such selective processes are faster than neutral evolution by a factor of about 1000 and would allow for independent generation of sites even after the split from its closest relative Drosophila simulans about 2.5 × 106 years ago. Notice that new sites are more readily generated in large populations. As discussed above, generating a new site may also require a neutral waiting time to T0 until at least one candidate site in the promoter region of the gene in question reaches the threshold distance r s from the target sequence, where selection sets in. For site formation to be efficient, however, selection must be able to set in spontaneously, i.e., T0 must not greatly exceed the adaptive time T s . This places a bound on the relevant length of the binding motif that can readily form in a promoter region of length L. Given L ≈ 300, for example, a motif with = 8 and r s = 3 could still allow for spontaneous adaptive site formation. (For longer motifs, corresponding to groups of sites with fixed relative distance, this pathway would require promoter regions of much larger L.) A more general case has recently been treated numerically in , where the dependence of the neutral waiting time on the G/C ratio of the initial sequence has been investigated. One may speculate that this adaptive dynamics is indeed one of the factors influencing the length of regulatory modules in higher eukaryotes. Clearly, the present model also allows for pathways of negative selection leading to the elimination of spurious binding sites in regulatory or non-regulatory DNA where the binding has an adverse fitness effect. This is important since under neutral evolution, candidate sites with a distance of at most r s from the target sequence occur frequently on a genome-wide scale. A recent study has indeed found evidence for such negative selection from the underrepresentation of binding site motifs over the entire genome . We have shown that under stationary selection the frequencies of nucleotides at any two positions of the binding sequence are correlated. For the two-state model, the correlations are the same for any pair of positions i ≠ j and can be computed exactly from the joint distribution (11). We emphasize that these correlations refer to an ensemble of independently evolving (monomorphic) populations and are not to be confused with linkage disequilibria within one population. This finding limits the accuracy of bioinformatic weight matrices, which are often assumed to factorize in the nucleotide positions even in the presence of selection. The predictions of our model lend themselves to a number of experimental tests. In the dynamical regime appropriate for eukaryotes (μ N ≪ 1), populations should be monomorphic at most positions of their binding site sequences and polymorphic at a few. On the other hand, the quasispecies model discussed in refs. [10, 11] (which assumes μ N ≫ 1) may be most appropriate in viral systems. The intermediate regime μ N ~ 1 with frequent polymorphisms and genetic drift could be realized in some bacterial systems and presents a challenge for theory. Thus it would be very interesting to compare the statistics of single-nucleotide polymorphisms at binding sites in eukaryotes, bacteria, and viruses. Polymorphism data are expected to contain evidence for adaptive evolution. However, statistical tests of selection must be modified for promoter sequences [40, 41]. A recent study uses data on binding sites in three yeast species and deduces the rates of sequence evolution . A complementary source of information are phylogenies of binding sites. Trees with functional differences between branches contain information on the generation of new sites or of interactions between sites and on the time scales involved. In a tree for a conserved site or group of sites with sufficiently long branches, the fuzziness of the sequences observed on different branches is given by the ensemble Pstat introduced above. For strong selection, Pstat lives on the quasi-neutral network of sequence states with maximal fitness, where two neighbouring sequence states are linked by neutral mutations or by pairs of compensatory mutations at two different positions. In the crater landscape for a single site, this quasi-neutral network consists of all sequences with a fixed distance r = rmax from the target sequence; see fig. 1(a). Beyond the two-state approximation for binding energies, it will be smaller since only some of the positions are energetically equivalent. For a group of sites, however, quasi-neutral networks can be larger since compensatory mutations can also take place at positions on different sites as shown in fig. 2(d) for the example of a signal integration module. This is consistent with experimental evidence that the sequence divergence between Drosophila melanogaster and Drosophila pseudoobscura involves compensatory mutations and stabilising selection between different binding sites . For weaker selection, site fuzziness increases further since Pstat extends beyond the sequence states of maximal fitness and is influenced by mutational entropy. As shown in fig. 1(f), one can explain in this way the observed fuzziness in CRP sites of E. coli. It would then reflect different evolutionary histories of independent populations, rather than sampling in one polymorphic population as in the quasispecies picture of refs. [10, 11]. (In a mean-field quasispecies, appreciable fuzziness occurs only for selection coefficients s ~ μ, minute in other than viral systems.) However, the data are also compatible with strong selection if the selection coefficients s α , and hence the value of rm, vary between different genes. Clearly, comparing Pstat with the distribution of sites in a single genome requires the assumption that the evolutionary histories of sites at different positions are at least to some extent independent. Future data of orthologous sites in a sufficient number of species will be more informative. Thus, further experimental evidence is needed to clarify the role of mutational entropy in the observed fuzziness. The present work was aimed at obtaining some insight into the molecular mechanisms and constraints underlying the dynamics of complex regulatory networks, thereby quantifying the notion of their evolvability. The programming of binding sites and of cooperative interactions between them is found to provide efficient modes of adaptive evolution whose tempo can be quantified for the case of point mutations. The formation of complicated signal integration patterns and of multi-factor interactions in higher eukaryotes, however, requires generalizing our arguments in two ways. There are further modes of sequence evolution such as slippage events, insertions and deletions, large scale relocation of promoter regions, and recombination. Our ongoing work is aimed at quantifying their relative importance in terms of substitution rates. Moreover, there are also more general fitness landscapes describing, e.g., binding sites interacting via the expression level of the regulated gene (such as activator-repressor site pairs) and the coupled evolution of binding sites in different genes. The rapid evolution of networks hinges upon the existence of adaptive pathways for these formative steps with a characteristic time scale T s ~ 1/(s μ N) much smaller than T0 ~ 1/μ, the time scale of neutral evolution. The presence of these two time scales has a further interesting consequence. If the selection pressure on an existing site ceases, that site will disappear on the larger time scale T0. It is possible, therefore, that large existing networks have accumulated a considerable number of redundant regulatory interactions acquired by selection in their past. This may be one factor contributing to their robustness against perturbations. This is formally solved by expanding in eigenfunctions of the mutation operator. In the case relevant here, the system remains close to equilibrium since the boundary current is much smaller than typical currents for r ≥ r s . Hence, P(r,t) ≈ Pstat(r) exp(-λ t) with λ = J(0)/Q(0) = μ(r s + 1)Pstat(r s + 1)/Qstat(r s + 1). We conclude that the waiting time for a single site is positive with probability Qstat(r s + 1), following a distribution ~exp(-λ t), and 0 otherwise. The resulting expectation value is T0 = Qstat(r s + 1)/λ. 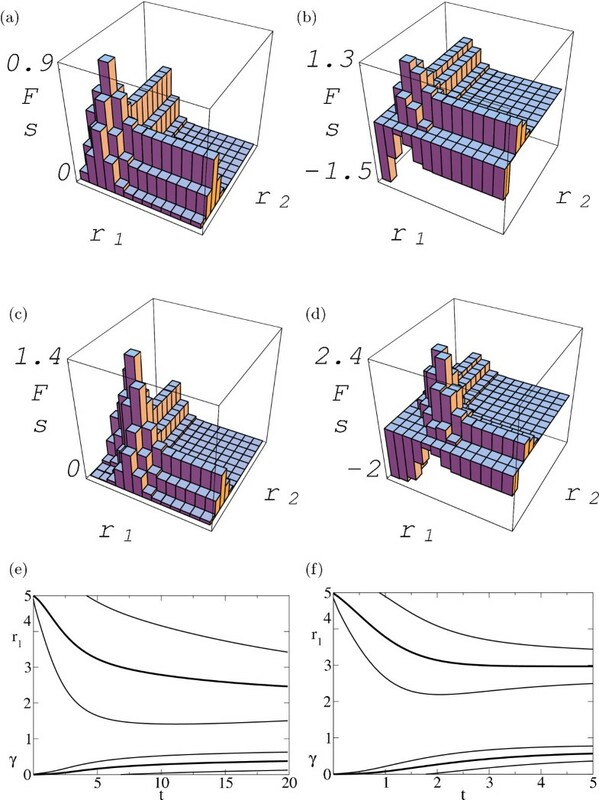 For L1 independent sites, the distribution of positive waiting times is still exponential, and to is given by an expression of the form (17) with a total boundary current . This yields as given by (13). The average waiting time (in units of 1/μ) becomes large for values of r s in the tail of the distribution , where . This is the case for . We are indebted to N. Rajewsky and D. Tautz for interesting discussions, and to P. Arndt and U. Gerland for a critical reading of the manuscript. This work has been supported by DFG grant LA 1337/1-1. JB carried out analytical and numerical work, SW performed numerical work and data processing. ML conceived of the study, carried out analytical work, and coordinated the project. All authors read and approved the final manuscript.